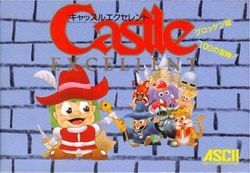 Castle Excellent (known as Castlequest outside of Japan) the sequel to a popular game released on several Japanese computers, known as The Castle. The Castle was the winner of a software contest hosted by ASCII Entertainment. As a result, it was ported to several Japanese computer platforms and gained a large collection of fans. ASCII then went on to develop Castle Excellent and released it for the MSX, as well as developing a version for the Famicom in 1986. The Famicom and MSX versions are not identical, although they share many of the same puzzles and solution techniques. While all of the rooms on the MSX version fit on one screen, the Famicom version of the game features rooms that are two screen width's wide, and thus scroll from side to side, allowing for much more content per room than in the MSX version. Another difference between the two versions is that in the Famicom version, the main character can attack his enemies with a knife, although it is a little difficult to actually succeed with such an attack. Nexoft licensed and released the game in the United States for the NES and changed the title to Castle Quest. It did not enjoy the same level of popularity that it received in Japan, as it is considered slow and too light on action for most western gamers' tastes. The kind-hearted princess Margarita princess was known for her rare good looks and beautiful singing voice, and she was loved by all of the people in the kingdom. However, Devil Mephistopheles who heard her singing, kidnapped the Margarita princess, and has confined her to Glocken Castle and made her his prisoner. Rafael Oji, a hero from the neighboring country, heard what happened, and is determined to help the princess by invading Glocken Castle and rescuing her. This page was last edited on 25 June 2012, at 10:53.